Alternatively, you can login using the webcode on the bottom right of your Media Lab RFID card. 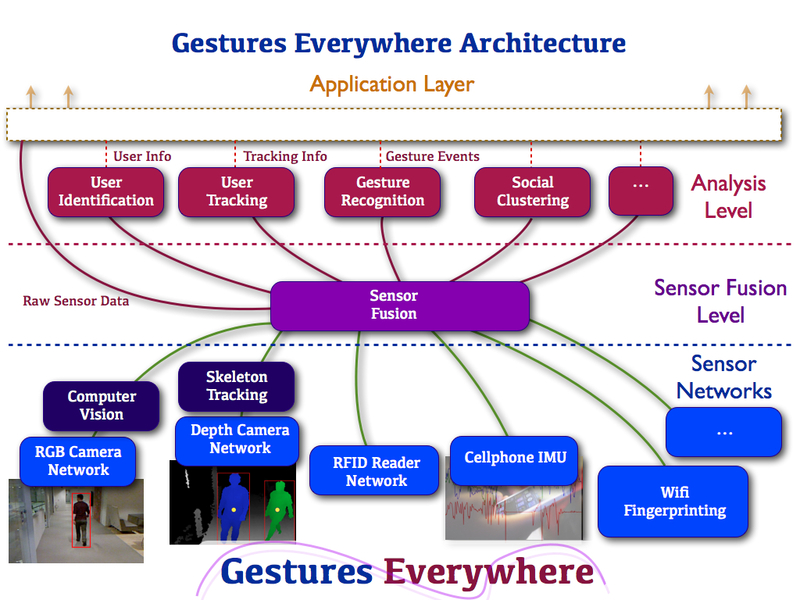 Gestures Everywhere is a multimodal framework for supporting ubiquitous computing. Our framework aggregates the real-time data from a wide range of heterogeneous sensors, and provides an abstraction layer through which other ubiquitous applications can request information about an environment or a specific individual. 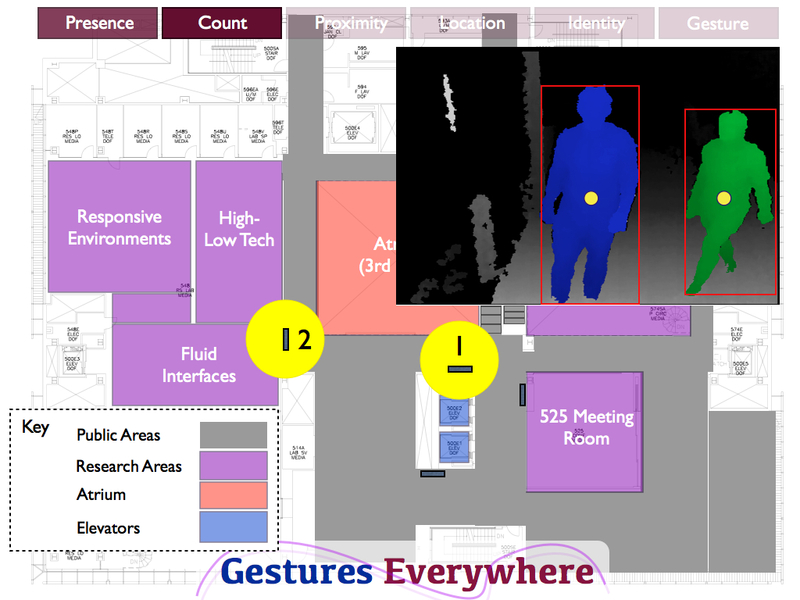 The Gestures Everywhere framework supports both low-level spatio-temporal properties, such as presence, count, orientation, location, and identity; in addition to higher-level descriptors, including movement classification, social clustering, and gesture recognition. 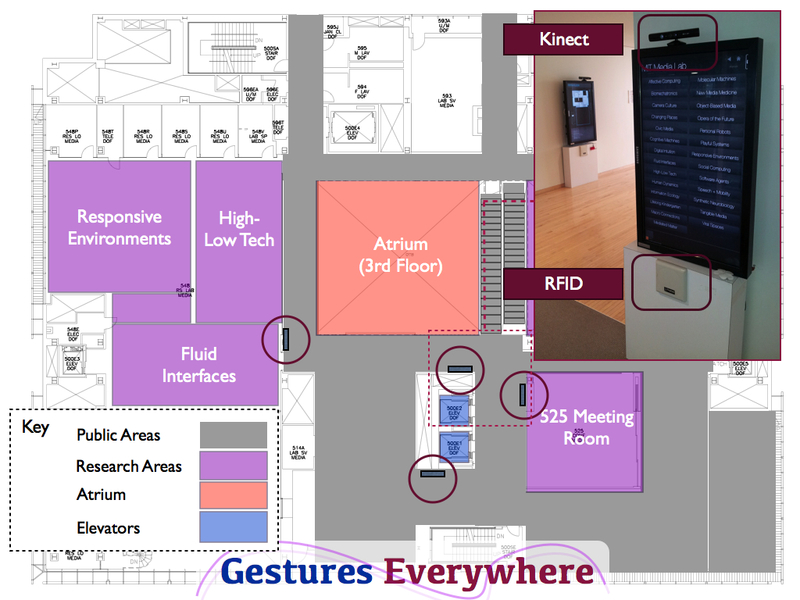 This video shows an example of the Gestures Everywhere framework being used for tracking a user as they walk around the 5th floor of the MIT Media Lab. 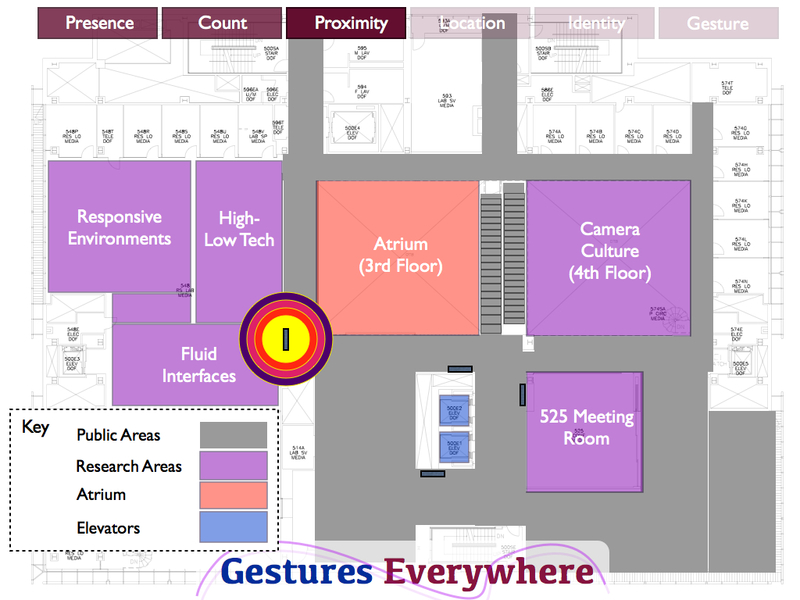 The four purple circles denote the location of the Glass Infrastructure displays, these circles will be filled if a presence is detected at that location. The filled green circles represent the estimated location of a user. 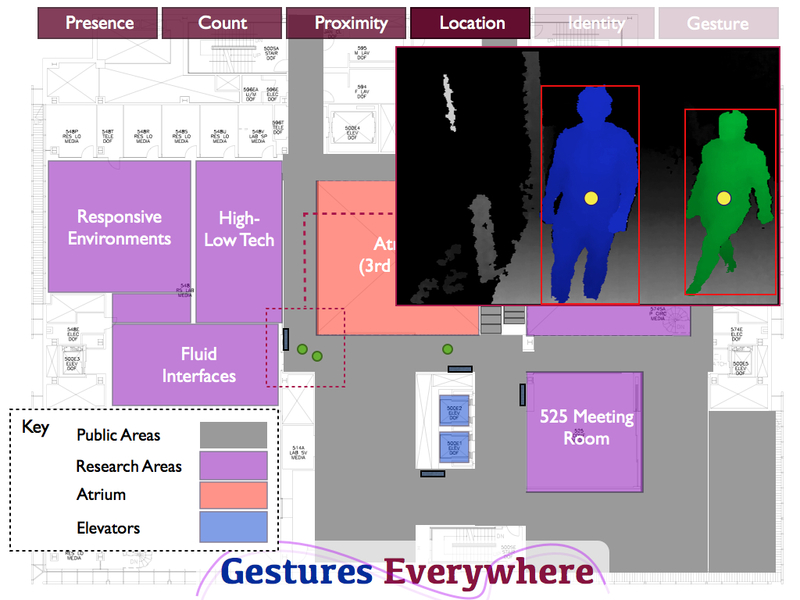 If the likelihood of a user's location drops below a specific uncertainity threshold then their location will no longer be displayed (hense why the user's location in the video is not displayed as they walk down the long corridor until they reach the displays located at the end of corridor). Sorry: the server is currently offline for maintenance, it should be online again soon. Enter the name of the person you are searching for. You can use either their fullname or email. 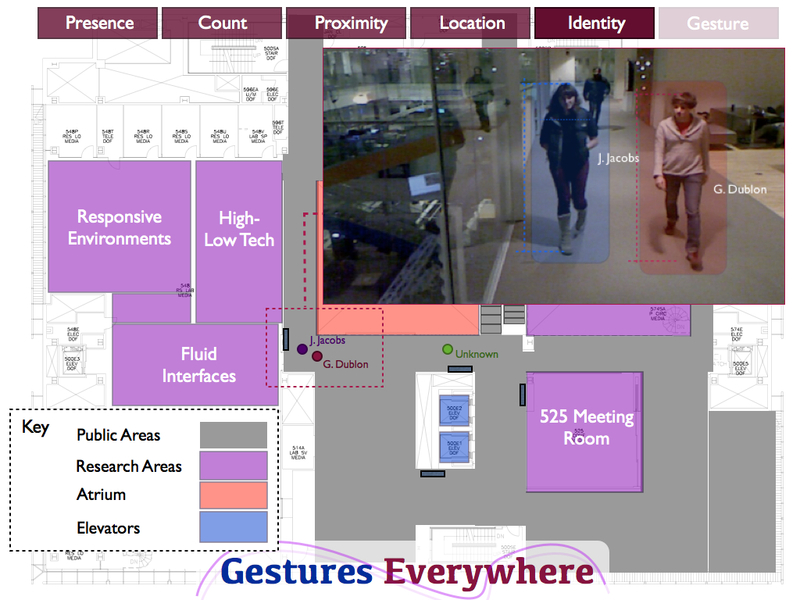 If the user is sharing their location data then the Gestures Everywhere framework will find the last know location of the user. You can edit your own sharing data using the Edit User Sharing Settings button above. The ping tool lets you send a message to a specific user. 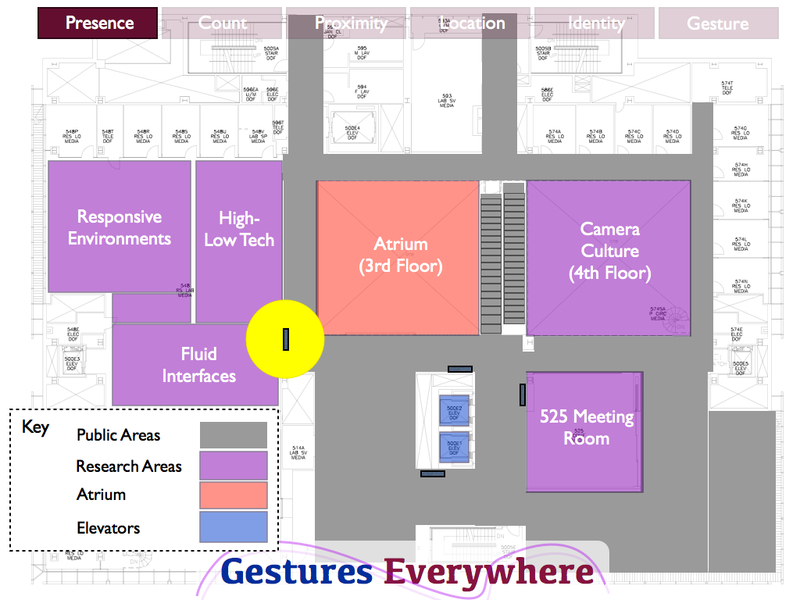 The Gestures Everywhere framework will then locate the specific user you want to ping and show them your message, using the most appropriate communication format, such as the nearest GI display, their cell phone, or via email. Enter the name of the person you want to ping (you can use either their fullname or email). Enter the message you want to send them. You need to login to send a ping. You can login using the 4 digit webcode on the bottom left of your Media Lab RFID card or member's badge. Events enable you to create tasks that should be actioned, given a specific event. 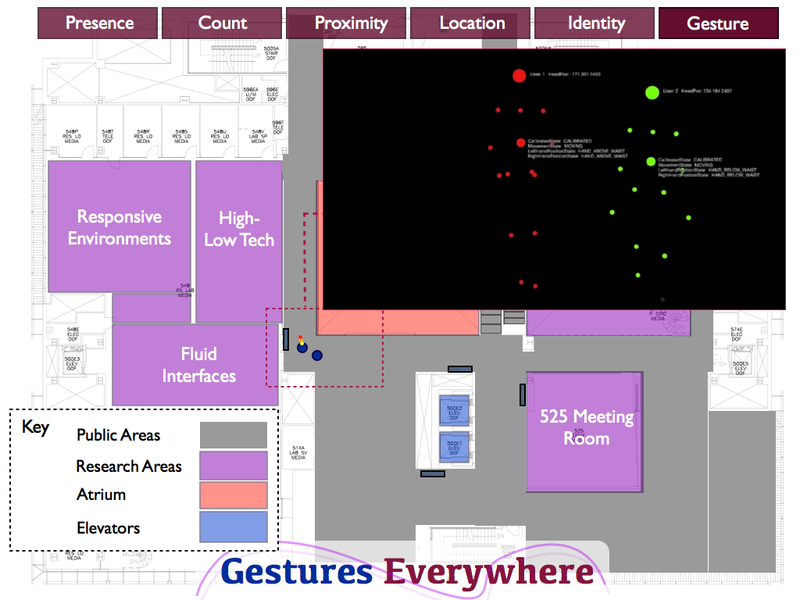 For example, you could create an event that sends you a message when a specific user is detected by the Gestures Everywhere framework. You need to login to create a new event. You can login using the 4 digit webcode on the bottom left of your Media Lab RFID card or member's badge. This tool lets you tag your current location. Press the button below to tag your current location. If you want to give the location a descriptor (such as "Home" or "My favorite coffee shop"), then you should enter the location descriptor first before tagging your location. You need to allow your browser to use your computer's location. You need to login to tag your current location. You can login using the 4 digit webcode on the bottom left of your Media Lab RFID card or member's badge. This tool lets you control who you are sharing your data with. Using this tool you can set who can see you, search for you, and send you messages. You need to login to edit your sharing settings. You can login using the 4 digit webcode on the bottom left of your Media Lab RFID card or member's badge. The data portal lets you access your personal GE data and control who you are sharing your data with. Using this tool you can set who can see you, search for you, and send you messages. You need to login to enter your data portal. You can login using the 4 digit webcode on the bottom left of your Media Lab RFID card or member's badge.